Detailed map of Africa by the pre-eminent British cartographer of his day. 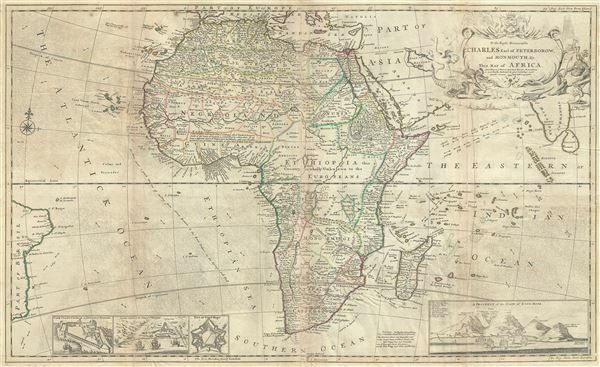 To the Right Honourable Charles Earl of Peterborow, and Monmouth, and C. This map of Africa, According to ye Newest and Most Exact Observation is humbly Dedicated by your Lordship's most Humble Servant H. Moll Geographer. A lack of true knowledge did nothing to prevent Moll, and other cartographers of the period, from positivistically speculating on the interior. Nowhere is this more in evidence than in Moll's unique approach to the course of the White Nile. Convention from the 15th century onward mapped the sources of the White Nile on the Ptolemaic model incorporating two great inland lakes, Zaire and Zaflan, at the base of a mountain range called the 'Mountains of the Moon' or as here the 'Luna Mountains.' Moll has retained both lakes prominently, even identifying islands and cities on their shores, but he does not connect either lake to the Nile. Instead Moll sends the White Nile westward where it dissipates into a series of lakes and swamps, almost, but not quite meeting with the Niger. As for Zaire and Zaflan, these lakes continued to appear in less and less cohesive form throughout the 18th century until they merged with the factual lakes Malawi and Victoria in 19th century. I am credibly informed that ye country about 400 leagues North of the Coast of Guinea is inhabited by white Men, or at least a different kind of People from the Blacks, who wear Cloaths, and have ye use of Letters, make Silk, and that some of them keep the Christian Sabbath. It is unclear what Moll is referring to and we have not seen this curious reference on another map. Be that as it may, Africa at this time was hardly without European influence. As indicated by the detailed toponymy of Africa's western coastline, various European powers maintained an active presence there, particularly along the Guinea or Gold Coast of modern day Guinea. Insets in the lower left quadrant depict Cape Coast Castle (Guinea), the Fort of Good Hope (South Africa), and in the lower right quadrant, the cartographer presents a beautiful view entitled 'A Prospect of the Cape of Good Hope' in which Table Mountain is clearly discernable. A fourth inset details James Fort on the Island of St. Helena, a place that would later become infamous as the prison of Napoleon Bonaparte. An elaborate title cartouche appears in the upper right quadrant. The cartouche illustrates various animals and activities presumably common in Africa: crocodile wrestling, snake fighting, and ostrich hunting. These scenes are observed by a serene woman, possibly intended to represent the allegorical 'Africa' and a lion in repose. The map is dedicated to Charles Earl of Peterborow and Monmouth. Here Moll is flattering Charles Mordaunt, 3rd early of Peterborough and the 1st earl of Monmouth. Mordaunt was a powerful military commander who earned his first military distinctions near Tripoli, which may be why Moll chose to so dedicate his Africa map. Moll, H, The World Described; or a new and correct sett of maps, (London) 1732. Good. Overall toning. Some additional toning on original fold lines. Verso reinforcement and slight loss to margins. Two sheets joined at center by publisher. Norwich, O., Norwich's Maps of Africa: An illustrated and Annotated Carto-bibliography, NOR 0067. Tooley, R. V., Collector's Guide to Maps of the African Continent and Southern Africa, p. 77-78, No. 59. Boston Public Library, Leventhal Collection, G1015 .M65 1709.